Not long ago, vitamin D was thought to have a singular function, to help maintain serum calcium levels by facilitating intestinal calcium absorption and helping to regulate renal excretion and bone remodeling. Modest amounts of vitamin D were known to be adequate to prevent low calcium levels and acute bone loss diseases such as rickets and osteomalacia. Today, not only are adequate levels of vitamin D intake for optimum bone protection being revised sharply upward, but newly identified roles for vitamin D have been discovered, indicating far wider health effects from this essential nutrient. Tissues possessing vitamin D receptors and/or expressing the enzyme for local activation of vitamin D include the immune system, skin, pancreas, prostate, colon, adrenal glands, brain, and others. Vitamin D appears to influence cellular differentiation and proliferation, immune system activity, insulin physiology, blood pressure regulation, and other body processes in ways never before imagined. Recent research is exploring the clinical implications of these new discoveries. The safety of high vitamin D intake has also been re-examined, with upper levels now set at a minimum of 2000 IU per day, and perhaps much higher. 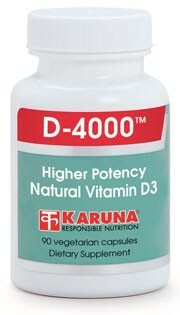 Karuna's D-4000 supplies highly-bioavailable vitamin D3 in a convenient amount for generous supplementation. Recently updated guidelines recommend increased vitamin D intakes for bone mass protection (J Am Diet Assoc 1998;98:699-706). Recent research has identified a role for vitamin D in supporting optimal neuromuscular function to stabilize balance and gait in elderly persons; total vitamin D intake must be above 400 IU for maximum effectiveness (Arch Intern Med 2006;166:424-30; J Am Geriatr Soc 2005;53:1881-8; Cerebrovasc Dis 2005;20:187-92; JAMA 2004;291:1999-2006). A recent meta-analysis of twelve trials concluded that vitamin D supplements totaling at least 700 IU/day help bones maintain their integrity during minor traumas (JAMA 2005;293:2257-64). Vitamin D activation occurs in many tissues, including cells of the immune system, skin, pancreas, prostate, colon, adrenal glands, and brain, indicating vitamin D functions never before imagined (J Cell Biochem 2003;88:315-22; J Clin Endocrinol Metab 2001;86:888-94). Vitamin D may be important for preventing either over- or under-activity of the immune system (Exp Biol Med (Maywood) 2004;229:1136-42; Annu Rev Nutr 2003;23:117-145). Vitamin D supports normal cell differentiation and inhibits excessive proliferation of body cells (Eur J Clin Invest 2005;35:290-304; Am J Clin Nutr 2004;79:362-371). Insulin-producing cells possess receptors for vitamin D, and adequate vitamin D may be crucial to normal insulin physiology (Diabetologia 2005;48:1247-57). Vitamin D appears to support healthy blood pressure, according to human clinical trials (J Clin Endocrinol Metab 2001;86:1633-1637; Lancet 1998;352: 709-710); one reason may be that production of renin, an enzyme important for blood pressure regulation is influenced by vitamin D (J Cell Biochem 2003;88:327-31). Several authorities suggest vitamin D intakes should be up to 2000 IU or more for optimal health (J Nutr 2005;135:317-22; J Steroid Biochem Mol Biol 2004;89-90:575-9). Safe regular intake of vitamin D appears to be at least 2000 IU per day (Am J Clin Nutr 2003;77:204-10; Am J Clin Nutr 2001;73:288-294). Suggested use for adults: One capsule daily, with a meal, or as directed.